All About Art: Oil Portrait Paintings – Real or from Photograph? Oil Portrait Paintings – Real or from Photograph? What is the difference between a portrait oil painting done from a photograph and the one created in a live session? Is there a difference and which one is better? 1. Creating portrait from a photograph is a faster more affordable way to get a portrait done. 2. Oil paintings take time, long time, a quality oil painting takes usually up to three months to make. Not because it is a slow process, but just because it takes time for paint to dry up. Other media, such as acrylic, require less time to dry up so they can be done a lot faster. 3. A portrait created from a photograph is a skillful copy of the photograph, and it is just that. A portrait created in person by a professional artist is most of the time not just a portrait but a work of art. It is more affordable than real portrait and doesn't require scheduling appointments and waiting for an Artist to become available. You get to chose how you look. You can pick a photo that you like the most and that is what you are getting back in form of a painting. You getting a signature of a well known artist, or at least possibly well know to be artist on your portrait, and one day it can worth a lot of money to someone. If a portrait is done from a photograph (and it doesn’t have to be a portrait, it applies to any painting done from a photograph) you just getting a copy, yes it can be a very professionally done copy, but it is a copy. In many cases it is better to just enlarge your photo and frame it, and it will look as good as the painting, but it will cost less. You are guaranteed to get a work of ART. It doesn't really matter if it is done a professional artist or an armature, it is real art. It is an investment. If done by a well known artist or an artist that is going to be famous the portrait is not just a portrait any more it is 'money in the bank'. Original paintings do not get boring over time like a photograph does. Some photographs have memories associated with them and can stay 'fresh' forever, but a copy of it will get boring soon enough. It is a status thing, very few people can say that they have an original oil portrait done by a professional artist in a life sessions. You will learn more about yourself every day you look at it. It will look different every time and the thing that real paintings have is every time you get to discover something new about them. Real portraits take time, be prepared to wait for a few months, after all you want the artist to be in the 'creative mood' when a portrait is created. You do not choose what you are going to look like. You getting real you, and even with many artist now accepting the idea that they should make people look a little better than they actually look (no one wants to see a portrait of themselves on a 'bad' day), it is still a pure view of the artist. This is how the artist sees you, and there are no second chances. They are more expensive, not just cost wise but the time you have to spend away from other things that you need to be doing, so these are for wealthy. TV made impossible things possible. When a person is on TV an Artist now can capture their character and emotions and translate them in to a portrait even if it is done form photograph. (This is harder with politicians since by the nature of their work they tend to hide their emotions). I'll let you to decide what is better and why. 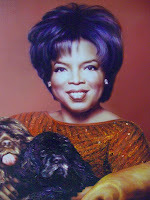 Let me know what you think about original oil painting of Oprah Winfrey above. You can always leave a comment here or visit Oil Portrait Paintings to see more oil portrait paintings and drop me an e-mail. 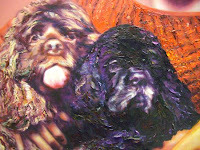 They are not duplicates - lol - this was done from a photograph - you have to see it in person to appreciate the texture.